Pure Move T4 review | What Hi-Fi? Vinyl isn’t the only technology that, at one time condemned to an imminent death, simply refuses to die. Radio, too, is bursting with vital good health - and shows no real sign of dropping its pace. Indeed, rather than its predicted decline, radio has added to its repertoire in the past few years - the introduction of internet radio has opened up the whole world of what used to be called “the wireless” to the enthusiast. The impressive modern shenanigans of internet radio are all well and good, but sometimes all that’s required is what was known in the ’80s as “a little transistor radio”. And that’s, pretty much, what we’ve got here. The Move T4 is a pocket-sized unit (it’s a little bit smaller, but deeper, than an iPhone) you can take out and about to the garden, or on a picnic, or from room to room inside the house. Not only does it have tuners for both FM and DAB radio, this little unit also embraces that classic radio term ‘wireless’ in a thoroughly 21st century way, with the inclusion of Bluetooth streaming. It adds alarm and clock functions to its abilities as well, and there’s a 3.5mm headphone output. It's available in a couple of finishes: black-with-silver or white-with-sort-of-copper. It’s powered by a rechargeable battery, good for a claimed 15 hours of life (22 hours if you stick to headphones). There’s a telescopic aerial on the top, and a little pull-out foot at the bottom so it can stand on a tabletop securely. The controls for mode selection are along the top, above the clear little screen, while volume controls and the on/off button (which doubles as a button lock – useful if the radio is jostling around in your pocket) are down the right-hand side of the unit. The four preset buttons on the front of the unit, under the screen, provide access to a total of 20 station presets. All in all, then, this is a handy little unit. Once we’ve charged the Move T4 up, we dive in to sort out some radio listening. As you would hope, setting up the little unit is pretty simple. 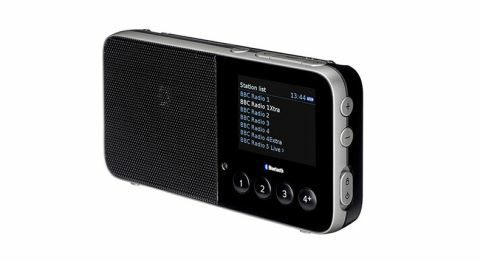 Set it searching and it will dig out DAB radio stations aplenty – and scrolling through the list to select the one you’re after is grandparent’s play. It must be said it took us a tiny bit of time to get used to the fact that the directional arrows on the top – pointing left and right – actually control movement up and down on the screen. Not a massive problem, obviously, but needless - and it caused minor irritation a couple of times. Still, easy enough. And tracking down an FM station is also as you’d expect. Push one of the directional buttons to run up and down the frequency and it will find the next strong signal. Hold down one of the preset buttons for a second or two, and the station is stored. For station presets four and higher, press the 4 button, then scroll using the top buttons to your desired preset number and push the select button that nestles between the two directional nubbins. It’s a tiny bit fiddly, but worth it, we think, to preserve the neat look of the T4’s face. Setting up Bluetooth is a breeze as well. Just set the mode appropriately and the T4 appears on your phone when you search for Bluetooth receivers. Our Spotify playlist is singing out in no time. This is a small unit, and it’s never going to be able to belt out a massive sound. It does ring true, though, with the midrange – so vital for decent radio listening – to the fore. It may not go terribly loud, but it’s a whole lot better than just playing from your phone’s speaker – although a dedicated wireless speaker inevitably betters it. Through the 3.5mm headphone output it stands up well, with a clear tone that’s even across the board. There are tone controls so you can adjust the treble and bass to your liking, along with some equalisation presets (including ‘tabletop’ and ‘outside’). We turn the treble down a notch or two, as it does hint every now and then at a rather bright top end and that mellows things out nicely. Bass we leave on the ‘0’ neutral setting – boost it at all and things start to get a little tubby. But the overall sound is perfectly listenable – and exactly what expect for from a well-sorted little radio such as this. If you want big booming sound at your picnic, you won’t get it here - your £100 would be better invested in a speaker – a UE Wonderboom, say – to stream your tunes to. That, though, isn’t really the point of the Pure Move T4. This gives you access to radio without eating into your mobile device’s data, and gives you the bonus of Bluetooth streaming if you desire it. And, as such, it’s a very competent little unit. Our only gripe really is the price. £100 seems a lot of money, however handy the T4 is, and it’s that really that brings its rating down a notch. If you’re happy with spending the money, we have no problem in recommending this little Pure unit. It does all you could expect without fuss.